There have been few video games which have featured native American Indians as the leading characters and what springs to my mind is Turok who undoubtedly, for me at least is the most memorable of any that have appeared. Well Turok hasn’t featured in a game for quite some time and so Human Head Studios have grasped the mantle to bring us Tommy a Cherokee Indian, or not as the case may be. 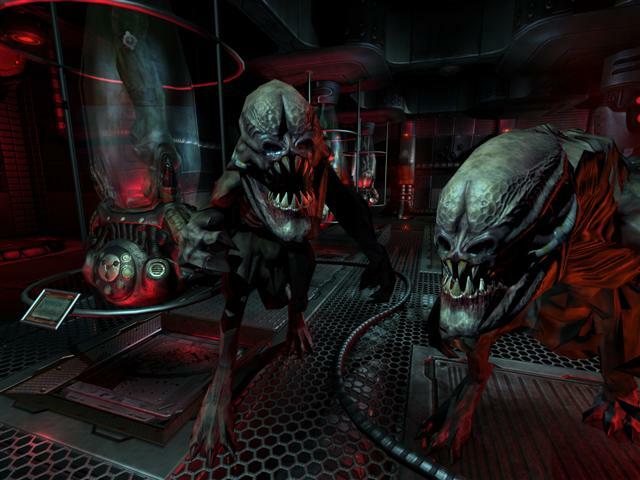 Tommy is the star of Prey which is the latest first person shooter to appear on Xbox 360; however from the game’s offset it is clear that he has a number of issues. The fact of the matter is Tommy is disillusioned with the “Old Ways” and simply wants to move out with his love of his life girlfriend. Well that’s all well and dandy except for one slight hitch; the world is being attacked by aliens, his girlfriend is taken and so is Tommy which instantly thrusts him into some sort of unwilling heroic role. The stage is set early on where the game shifts from a small bar to the inside of the alien ship which looks more akin to a human processing plant. With the aid of accepting the “old ways” Tommy becomes hell bent on rescuing his girlfriend which becomes his only real motivation throughout the entire game. Prey is a first person shooter in which players assume the role of Tommy as he takes on the alien forces that have attacked the earth. What Prey cleverly does is take the successful first person shooter template of old where it’s a single route through the game’s levels whilst blasting anything that gets in the way and then adds its own flavour to proceedings. In this case is some impressive use of a 3D space. What predominately differentiates Prey from its peers is the fact that players encounter all manner of mini puzzles as they navigate the game’s areas. The puzzles aren’t your simple find a key card to unlock a door type scenario that gamers have been used to for years in number of games both recent and in more distant times. In Prey players are faced with the insane and the sublime rolled into one. To begin to describe the puzzle element in Prey, one has to start by looking at the wall walking feature which simply allows Tommy to walk along special walk ways which effectively defy the laws of gravity. So in one instant you might start on the ground as normal and then end up on the ceiling upside down, however your perception is that the ceiling has now become the floor and vice versa. It’s a very clever technique and one that can effectively double the size of a seemingly small area. The puzzles also feature things like shooting switches which then orientates the room in accordance to which switch has been activated. One example has Tommy trapped in a large box with a track on each of the sides. By shooting the correct switches which in turn changes which side is the floor/ceiling, Tommy is able to steer an energy box along the track to a power source and thus freeing him from his predicament. It’s very simple but highly unusual game play for a game of this type. Another feature in Prey is the fact that Tommy can project his spirit from his body and then control it as he pleases. This ghost like form allows Tommy to reach inaccessible areas, however slightly contradictory to being a ghost his spirit is somehow able to interact with the alien switches that litter the ship which as you would expect are crucial for progress. Another side of the spirit form is that when Tommy messes up by either being shot, mauled or splattered after a nasty fall his spirit lives on and he enters the spirit world. Here Tommy’s spirit can then shoot some weird circling creatures that I guess replace the chirping birds that are often associated with a knockout blow; to gain energy for him and his spirit form. It’s a mini game of sorts and basically means that Tommy never dies no matter what the game throws at him. Once Tommy’s spirit has spent enough time there he is warped back pretty much to the same place where he died and so players can continue on as if nothing had happened. I’m in two minds about this feature as for starters it’s great for keeping the game play flowing for less experienced players as it does away with the tried and trusted checkpoint system favoured in games of this type. However for more experienced players it kind of takes away any true skill required to progress as simple persistence is enough to get through. Considering the story mode is not the hardest of games I got the feeling that at times the game was offering me far too much of a lifeline thus diminishing any feelings of accomplishment. Puzzles and spirits aside, at heart Prey is a first person shooter which means players do get to embark on a number of space battles with the aliens. There are a number of weapons which are gained as the story progresses in which to dish out punishment; with my favourite being an acid launcher which acts like a shotgun but spews acid at enemies for a melting face acid burning death! The weapons are organic looking and superbly designed but are based on staple weapons you would expect from a first person shooter. The gun battles themselves are reasonably engaging as enemies will hide behind cover or toss grenades in your direction. However most enemies especially later on in the game seem to float around trying to avoid your fire and not really use any advanced tactics against you. So Prey ends up as a simple shooter that really offers no differences from other similar games such as Quake or Doom. To mix things up a little Prey allows players to pilot some small craft which are a welcome addition as the on foot sections are rather enclosed. Players are able to play with the physics engine a little as some craft have tractor beams fitted, allowing you to move heavy objects. Prey uses an enhanced Doom 3 engine and to be brutal it shows. Whilst Prey has its own graphical style, playing it does feel very familiar as the two games are similar in design bar the obscure puzzle element of Prey. That said Prey does look very organic and full of gloomy atmosphere. The walls have that wet look which in this case works very well especially as some of the interiors have that fleshy look. There are some questionable holes in walls that resemble human orifices and I’m sure there were a few raised eyebrows during the game’s development. In general Prey does look very good despite being predominately enclosed throughout. There’s certainly a lot or organic combined with technology environments and in this respect Prey does lack variety. However progression (which is very linear indeed) is fast paced and runs pretty smoothly. I did encounter a few frame rate dips at times although these didn’t affect game play at all and were far too infrequent to worry about. Sound is of a reasonable standard, with Tommy being the typical disgruntled hero using some rather down to earth language at times! It’s good that you can hear his comments as you play and gives a tiny insight into how Tommy feels at various points through the story. Other vocal performances are as you would expect but nothing worthy of an Oscar and I guess the game doesn’t really require Oscar winning performances in the first place as it’s a shooter rather than a character driven RPG. The weapon sound effects are meaty and sound convincingly powerful especially with the volume turned up. I can’t really say much more about the sound as it really does what it says on the tin so to speak. Prey doesn’t have the longest single player game and when you combine this with the fact that Tommy doesn’t die means that players will have an easy time completing the single player game in a weekend. That said, there is an extra difficulty to try and of course I’m sure many players will want to play through again just for the hell of it. To combat this to some extent, Prey features Online and system Link play for up to 8 players. There are two modes of play which are death match and team death match spread across several weird and wonderful maps which incorporate the great use of 3D space. The online play does take a while to get used to as it remains fast paced yet with the sublime wall waking and portals makes it a fun engaging and a little confusing experience. It’s a shame that modes like CTF aren’t included as the level design could make for some seriously messed up battles! The multiplayer will no doubt keep achievement hunters entertained for a while however I feel that after a while Prey’s multiplayer will only be played by the new players and die hard players that only have one or two games. There’s simply not enough substance here for prolonged play. And so we have it, in a nutshell Prey offers a surreal and entertaining playing experience; however I did feel that it was a one trick pony, albeit a very good trick indeed. The linearity of the game doesn’t do it any favours yet at the same time you can see that the developers wanted to not confuse the player to the point of simmering frustration that over boils into pad throwing anger. I like Prey and think that the team have done well to reinvent and dice the traditional shooter formula. It’s a shame that the Spirit element takes away any true skill and genuine feelings of accomplishment however Prey does remain engaging and fun. Prey is full of great level design and smooth looking graphics that make it a showcase game for the system when you have a few friends over. It’s not overly complicated and it pushes all of the correct buttons. Sadly for players without Xbox Live the experience is rather short especially if you are a gamer who invests more than a few hours per day playtime.